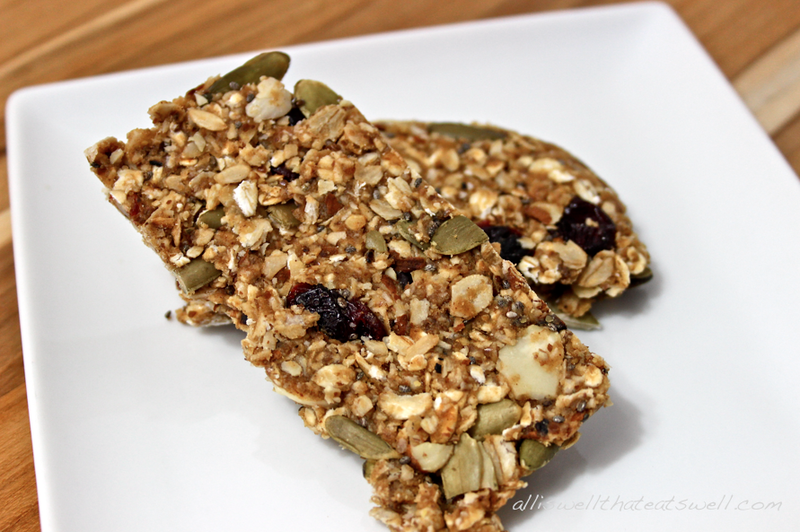 I have been working on a healthy and easy make-ahead power bar recipe for almost three weeks now and FINALLY got it just the way it should be! I am so so excited to share this recipe with you today! It is super yummy and delicious. Just make a batch on your day off and you're set with a nutritious, wholesome bar for breakfast or a snack for the whole week! Oh yeah, and they are also great for a travel snack! This health bar is packed with all kinds of nutritious yumminess- peanut butter, almonds, pumpkin seeds, chia seeds, flax seeds, oats and more- to fuel you for a busy work or school week ahead! And the best part is all of these ingredients have a whole host of health benefits to keep you healthy and feeling fabulous! I hope you love them as much as we do here! 1. Toast oats in a small saucepan over low heat for a few minutes, continuously turning them with a wooden spoon, using care not to burn them. 2. Place oats into a bowl and add pumpkin seeds, dried cranberries, almonds, chia seeds and milled flax seed. Combine ingredients well. 3. Using same saucepan you used to toast the oats, heat peanut butter with brown sugar over low heat until they become a liquid-like consistency. Immediately add this to the bowl with the oat mixture, followed by the honey and combine all of the ingredients well. 4. Take a baking dish (the size depends on how thick you want the bars- I used an 8.5 x 4.5 cake loaf pan) and line with sealable plastic wrap or parchment paper (this will facilitate the removal of the bars from the pan once they are ready). Transfer the "batter" to the lined baking dish and press it down firmly with your hands so that it is even and well packed down. 5. Pop the baking dish into the freezer for about 45 minutes to an hour. 6. Once they are ready, take the dish out of the freezer and lift the bar mixture out of the dish by pulling up on the plastic wrap or parchment paper. Slice into 12 square bars and ENJOY! PS- my rec is that you keep them in the fridge in zip-lock bags or an airtight storage container to keep them super fresh and tasty! PPS- it's super fun to play around with the ingredients in these bars...add some dark choc chips for anti-oxidant value, substitute almond butter for the PB, or use your favorite nuts and seeds!...go nuts!